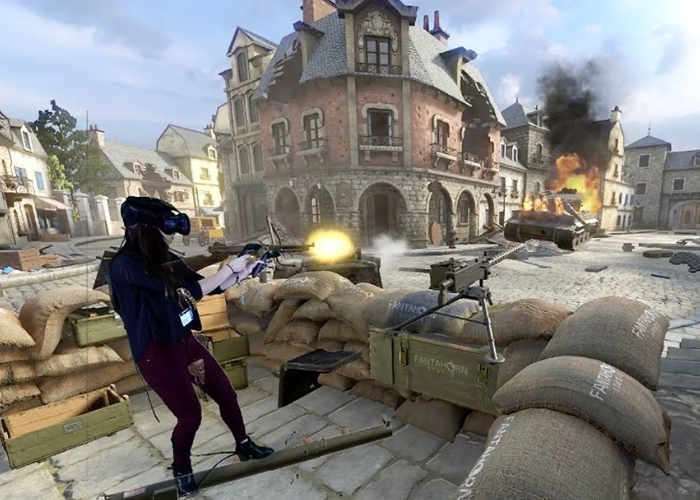 Virtual reality headset owners looking for an immersive battlefield experience may be interested in Front Defense VR which is being created by developer Fantahorn Studio and is now available via Viveport. Front Defense VRHas been published by HTC. For the Vive and will be available via Steam from July 7 onwards. Check out the mixed reality demonstration below to learn more about what you can expect from this immersive battlefield experience. Immersing players in the role of an Allied Forces hero defending a fictional European town against an entire Axis armored division, Front Defense tasks you with using the motion-tracking of the HTC Vive’s head-mounted display and controllers to duck, dive, switch weapons, lob grenades, call in airstrikes, and man Bazookas and mounted machine guns. Players must master each of these mechanics as they you take on an entire Axis armored division: from well-armed infantry to armored cars, tanks and Stuka dive bombers.